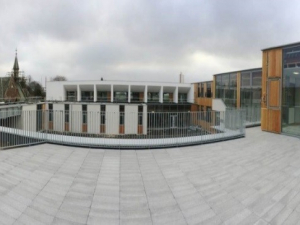 The project comprises the design and construction of a new modern two stream Primary School with Community Facilities incorporating the refurbishment of an existing Grade B Listed school building with demolition of 1960’s blocks. The building takes a courtyard form to unite the nursery, primary and public elements of the programme and to create a protected external learning space. The building achieved an ‘A’ rated EPC status with the use of a Biomass Boiler and underfloor heating. Services designed to BIM Level 2.